Habit: Shrub, small tree, erect, (1)2--5 m. Stem: twig generally white-tomentose, glandular or not. Leaf: spreading; petiole 4--10 mm; blade 4--6 cm, 2--3 cm wide, lanceolate to ovate, flat, dark green, dull, sparsely glandular-hairy, +- papillate, scabrous, base wedge-shaped to +- rounded, tip acute, margin entire. Inflorescence: panicle, 3--8-branched; nascent inflorescence pendent, axis 1.5--2.5 cm, > 1 mm wide; bracts leaf-like, green, persistent, stiff, densely short- and long-white-nonglandular-hairy, occasionally glandular-hairy; pedicel 2--4 mm, glandular-hairy. Flower: ovary densely white-nonglandular-hairy, sparsely glandular. Fruit: 8--11 mm wide, depressed-spheric, sparsely nonglandular-hairy; stones free. Chromosomes: 2n=26. Ecology: Rocky coastal uplands, maritime chaparral, conifer forest; Elevation: < 800 m. Bioregional Distribution: NCo, w KR, NCoRO; Distribution Outside California: to British Columbia. Flowering Time: Mar--May Note: Arctostaphylos ×media Greene (prostrate to mounded shrub < 1 m; inflorescence +- raceme, 0--1-branched) presumed hybrid with Arctostaphylos uva-ursi. Synonyms: Arctostaphylos columbiana f. tracyi (Eastw.) P.V. Wells; Arctostaphylos columbiana var. tracyi (Eastw.) J.E. Adams; Arctostaphylos tracyi Eastw. 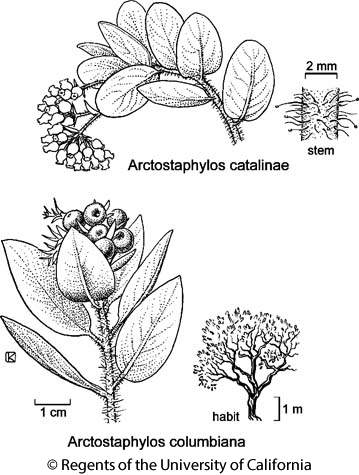 Citation for this treatment: V. Thomas Parker, Michael C. Vasey & Jon E. Keeley 2012, Arctostaphylos columbiana, in Jepson Flora Project (eds.) Jepson eFlora, http://ucjeps.berkeley.edu/eflora/eflora_display.php?tid=13918, accessed on April 19, 2019. NCo, w KR, NCoRO; Markers link to CCH specimen records. Yellow markers indicate records that may provide evidence for eFlora range revision or may have georeferencing or identification issues. Purple markers indicate specimens collected from a garden, greenhouse, or other non-wild location.